Explore our heat pump selection and contact us for a free no obligation quote today. Effectively Resists Corrosion: While traditional copper coils don’t always stand up to corrosion, the all-aluminum Micro-Channel coil stands up in tough environments. Utilizes Eco-Friendly Refrigerant: R-410A is utilized in this unit because it is the Earth-friendly, non-ozone-depleting choice. Swept-Wing Fan Blade: The utilization of a swept-wing fan blade helps reduce unwanted noise associated with operation. Hardy Finish: The FT4BE is a unit that will last. This Frigidaire unit is constructed using galvanized steel coated in a corrosion-resistant, polyester-urethane finish. Reach the Max Efficiency Ratings: The highest SEER ratings for this heat pump model are achieved by pairing it with an air handler or gas furnace that includes an energy-efficient motor. 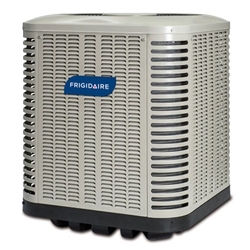 ENERGY STAR Designated: Specific matches and sizes of this heat pump meet ENERGY STAR efficiency requirements. Best Standards Maintained: 144 quality checks in total are performed on this heat pump during the manufacturing process. It’s always best practice to buy the most efficient heating and cooling system you can afford. The FT4BE, when paired with our engineered coils or air handlers, offers efficient 14 SEER, 7.7 HSPF performance. However, for an extra efficiency kick, you can pair this unit with an indoor unit that has an energy-efficient motor and enjoy up to 15 SEER and 8.5 HSPF. Two-Stage Heating and Cooling: For more consistent temperatures, this heat pump operates in two stages. In addition, two-stage operation means you can enjoy increased dehumidification capabilities. Intuitive: This unit's CoreSense technology can protect your compressor from damage. It detects system conditions that could hurt your compressor and shuts the unit down until a contractor can diagnose the problem. Reduce Unwanted Noise: Specific features of this unit help significantly reduce the amount of noise this heat pump makes while operating. These features include a compressor sound blanket and a swept-wing fan blade. Exceptional Finish: This unit offers superior corrosion resistance with the galvanized steel outer shell coated in a polyester-urethane finish. ecoLogic® Green Seal: Looking for peak energy efficiency paired with home comfort? Choose a unit that qualifies for the ecoLogic green seal (like the FT4BF). ENERGY STAR Approved: Select sizes and matches of this efficient heat pump meet ENERGY STAR requirements for efficiency. Powered by Eco-Friendly Refrigerant: Refrigerant is one of the most important components of your heating and cooling system. That is why it is important to choose a unit, like this one, that is compatible with environmentally-friendly R-410A refrigerant. Highest Heat Pump Quality: In order to make sure that this heat pump meets our quality standards, it is checked 144 times before making its way to homeowners. The FT4BF series of heat pumps reaches extra-high levels of efficiency and contains additional features that make it both eco-friendly and reliable. Make sure that when you go to buy your new heat pump you consult your contractor to find out the exact ratings of your complete system (this will include indoor components as well). Inverter Driven: The inverter-driven rotary compressor in this Frigidaire heat pump helps the unit modulate from 49% to 118% of capacity in five steps – saving energy, operating quietly and providing more even temperatures. Low Sound Levels: This iQ Drive system operates at incredibly low sound levels - down to 58 dBA in certain sizes. One of the Greenest Systems Available: Premium heating and cooling comes with more than just efficiency. This unit qualifies for the ecoLogic® green seal which takes other things – like home comfort features – into account. Surpasses ENERGY STAR Standards: This unit delivers on the promise of high efficiency by exceeding ENERGY STAR benchmarks in certain sizes and matches. Earth-Friendly Choice: Homeowners who are looking to go green should choose an HVAC system that uses eco-friendly refrigerant (R-410A) like this unit. High Quality Standards Maintained: Check, check and recheck! This heat pump undergoes 144 quality checks during the manufacturing process to ensure that proper practices were used during construction. The FT4BG iQ Drive heat pump reaches extraordinarily high levels of energy efficiency, overall home comfort and performance power. With iQ Drive technology, this unit provides ultra-quiet sound levels and efficient performance.